This is great! Love the calendar to give help keep you on track and also give you ideas when you are exhausted from the work day... Thanks! Meal planning definitely makes things easier.... so why do I fight it??? I may have to download that template and just do it! Oh how I wish I did that! Meal planning is by far a big stressor in our household. I wish I had some really good tips. All I can think of is my birthday party gift idea. We get invited to a lot of birthday parties and I always stress and waste time trying to figure out what gift to get. One party I gave the birthday girl a beach pail paired with some shovels, beach toys, and a beach towel. It was a hit! So next party I did the exact same thing. It's a relatively inexpensive but nice gift. And you can stock up on beach towels and beach pails/toys so that you can just whip out a gift in no time! I know, silly, but that's all I got. This is awesome! 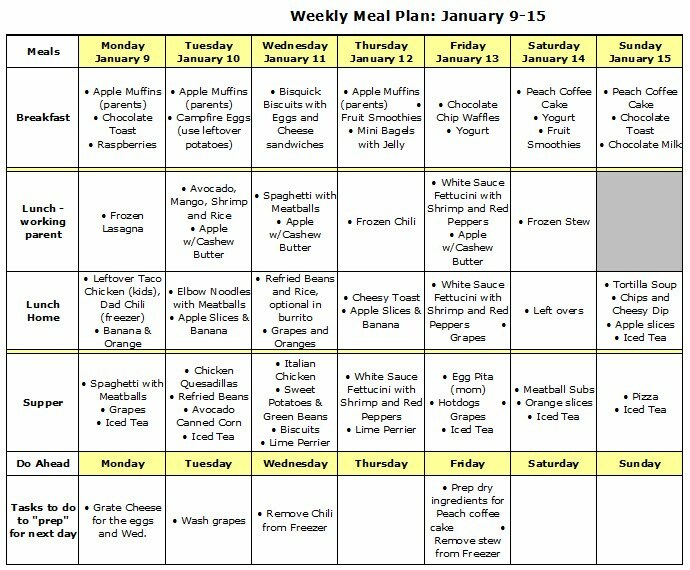 I've been looking for something like this since I've started to try to plan weekly meals. Since I don't plan lunches, I used that row to put what activites we have planned for the evening. This lets me know if we have to eat early or later and if it needs to be something quick like pizza or can be a real sit-down meal like steak and potatoes. Thanks for sharing!!!!! Love your blog, BTW. I'm so glad it was useful for you Viv! I love how you coordinate activities for your little family, that sounds really fun!! I think one can never have too many beach shovels because ours are always getting lost or left behind! Great gift idea for S. Florida!! Honestly it took me years of discipline and an ironclad will power to get control of my budget! Once I got addicted to staying on budget, it was easy to get myself to make the meal plan and stick to it! You are very welcome! Hope this calendar works for you. Welcome back! 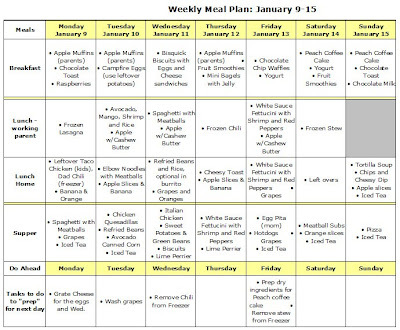 I hope this meal planner works for you! !